An MOU was signed to strengthen DBAR-PEEX Cooperation at the 3rd Pan-Eurasian Experiment (PEEX) Science Conference & the 7th PEEX Meeting held in Moscow, Russia on September 19-21, 2017. Prof. Guo and Prof. Markku Kulmala sign an MOU on DBAR-PEEX Cooperation. 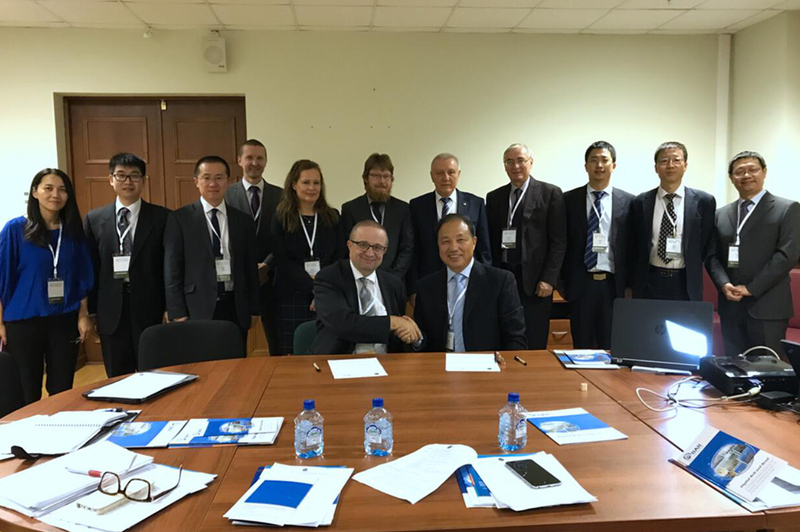 The conference was co-organized by the Digital Belt and Road (DBAR) Committee in partnership with its international counterparts including the Lomonosov Moscow State University, the University of Helsinki, and the Research Institute for Aerospace Monitoring, and co-chaired by Prof. Nikolay Kasimov, Prof. Valeriy Bondur, Prof. Markku Kulmala, Prof. Sergey Dobrolyubov, and Prof. GUO Huadong. It was attended by more than 100 experts from 12 countries including China Canada, Denmark, Finland, the Netherlands, Norway, Russia, Sweden and Switzerland. A seven-member delegation of DBAR, led by Prof. Guo, was invited to attend the conference. On the opening ceremony on September 19, Prof. Guo was invited to participate in the roundtable discussion on "Europe - Russia - China collaboration, identification of the key topics for future collaboration". The discussion focused on the role of PEEX in the Belt and Road context, the importance of the "Open data and data policy" for the future collaboration between research infrastructures of EU - Russia - China, and the co-design of future calls in EU, Russia and China. A closed-door meeting on the DBAR, PEEX and BRICS Program Cooperation was held on September 20 to explore cooperation mechanisms, clarify key areas of collaborative research, and crystalize research goals. During the meeting, the University of Helsinki and the Research Institute for Aerospace Monitoring have expressed their wishes to join DBAR International Center of Excellence (DBAR-ICoE). Prof. Guo, Chair of DBAR, and Prof. Markku Kulmala, Chair of PEEX, signed an MOU on DBAR-PEEX Cooperation, reaching a consensus on the cooperation framework of the two sides and developing cooperative research for global sustainable development. 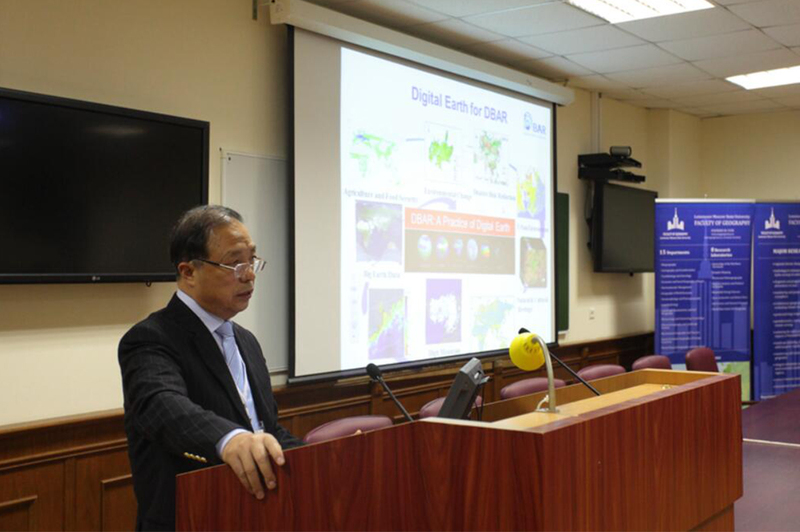 On the afternoon of September 20, Prof. Guo was invited to give a presentation entitled "DBAR: An International Science Program for Regional Sustainable Development". He elaborated the program from the aspects of concept, vision, goals, research framework and cooperation modes, and introduced its research in such fields as environmental change, natural disaster, food security, world heritage, water resources, coastal zone, urbanization, high mountain and cold regions, as well as the construction of big Earth data platform for the Belt and Road region sustainable development. Prof. Guo delivers an invited presentation on the conference. He proposed that DBAR and PEEX, sharing common vision and objectives, should pool research advantages for further cooperation in the realm of space-based Earth observation. Subsequently, a DBAR Special Session was held and DBAR working groups reported their researches in various fields such as agriculture and food security, world heritage protection, and High Mountain and cold regions. PEEX is a multidisciplinary, multi-scale research initiative aiming at resolving the major uncertainties in Earth System and Global Sustainability Science concerning the Arctic and boreal Pan-Eurasian regions including the impact and influence of China. It is a bottom up initiative by several European, Russian and Chinese research organizations and institutes. The 1st PEEX Science Conference was held in Helsinki, Finland in 2015, and the second in Beijing in May, 2016.